Let’s discuss the Fed again. I know: We are all fed up with the Fed. However, it’s a light week for other news with the exception of the hurricane-abbreviated Republican convention. Besides, Fed Chairman Ben Bernanke will present his widely anticipated annual speech at Jackson Hole on Friday. I’m sure it won’t be as good as the one Ann Romney delivered last night at the convention. The one Bernanke presented on August 27, 2010, was especially important since it set the stage for QE2, which was implemented right after the mid-term elections on November 3. Investors may be expecting that Friday's will do the same for QE3. It’s worthwhile reading Bernanke’s letter to see how to provide more or less the same answer to 22 questions. He did warn that “monetary policy is not a panacea,” but proceeded to defend his view that the Fed can still do more. He defended the use of “nontraditional policy tools, such as balance sheet actions…” In his opinion, they’ve promoted a stronger economic recovery by lowering bond yields. He didn’t explain why the FOMC seems inclined to do more given that yields are at record lows. He dismissed the suggestion that the Fed is redistributing income and wealth by stating that the Fed’s top priority is to boost economic growth for the good of us all. During the week of August 22, deposits at the Fed held by depository institutions totaled $1.51 trillion, near the record high of $1.68 trillion during the week of July 13, 2011. Yet commercial and industrial loans have increased by $268.1 billion since late 2010. If you are looking for better-than-expected global economic indicators, welcome home; they are mostly here in the US. Earlier this month, July reports for payroll employment, retail sales, and industrial production were all on the strong side, with all three rising to new cyclical highs. July durable goods orders were also strong, though they’ve been weak excluding transportation industries. Citigroup’s Economic Surprise Index continued to rebound in late August. Railcar loadings of intermodal containers rose to a record high in mid-August. (1) World Production. Global industrial production has flattened out over the past four months through June. 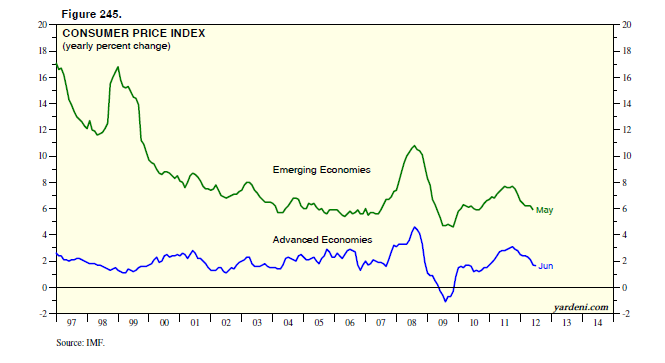 It’s actually been flat for the so-called “advanced economies”, and it recently went flat among the emerging ones. Available data for July show solid increases in the US and China. Upticks were recorded last month in Russia, Taiwan, and Poland. Thailand and Singapore were down. (2) Germany. Among the latest and worst economic indicators are Germany’s Ifo Business Confidence Index and its components. Germany’s DAX is highly correlated with the current component of the Ifo, which suggests that the rally in German stock prices may soon be over. (3) China. This morning we learn that profits at China's industrial companies dropped sharply by 5.4% y/y in July for a fourth straight month. There was a huge divergence between the profits of state-owned companies, which plunged 12.2%, and private sector profits, which rose 15.5%. The preliminary version of HSBC Corp.'s monthly purchasing managers' index showed August manufacturing activity fell to a nine-month low with the new export orders index the lowest in three years. Corn and soybean futures prices reached record highs this month, and wheat rose to its highest since 2008 as crop conditions worsened in the US grain-growing regions. Expectations that Fed Chairman Ben Bernanke might set the stage to announce QE3 in his Jackson Hole speech this coming Friday seemed to give grain prices a lift last week. His QE2 speech at Jackson Hole on August 27, 2010 boosted grain prices over the rest of that year through the first few months of 2011. The risk for the economy and for the stock market is that higher food prices will reduce the purchasing power of consumers, which would depress the economy and corporate earnings. Over the rest of this year, higher grain prices should be offset by lower meat prices. The USDA estimated last week that the CPI food index will rise 2.5%-3.5%, and is likely to be higher next year when meat prices are expected to rise. Evel Knievel was an American daredevil, who attempted over 75 ramp-to-ramp motorcycle jumps between 1965 and 1980. In 1974, he failed in his attempt to jump across Snake River Canyon in a rocket. He survived, and died in 2007 of pulmonary disease. Fed Chairman Ben Bernanke may be about to try to outdo Knievel with an even greater stunt: attempting to leap over the fiscal cliff at the beginning of next year. I think there’s a chance that he might announce during his August 31 speech at Jackson Hole that the Fed will launch an open-ended QE3 program with the hope of turbocharging the economy so that it can leap over the cliff. San Francisco Fed President John Williams, a voting member of the FOMC, was the first to advocate this stunt in an interview reported in the 7/23 FT. He floated the idea again in an interview reported in the 8/10 issue of the San Francisco Chronicle. When he was asked whether QE3 should be saved to cushion the fall off the cliff early next year, if necessary, he responded: "We want to position the economy to be strong in advance of that. If you are really worried about running out of ammunition, you want to act more aggressively, more quickly and better prepare yourself for that eventuality." Boston Fed President Eric Rosengren, who is a non-voting member of the FOMC, seconded Williams’ motion for open-ended QE3 in an interview reported in the 8/7 WSJ. According to the minutes of the July 31-August 1 FOMC meeting, released yesterday, "Many participants expected that such a [QE] program could provide additional support for the economic recovery both by putting downward pressure on longer-term interest rates and by contributing to easier financial conditions more broadly." “The magnitude of the slowdown we’re discussing next year is significant,” CBO Director Douglas Elmendorf said at a morning briefing on August 22. He warned that going over the cliff could cost the nation about 2 million jobs. In any event, the latest FOMC minutes noted: “Many members judged that additional monetary accommodation would likely be warranted fairly soon unless incoming information pointed to a substantial and sustainable strengthening in the pace of the economic recovery.” There was no similar comment about taking action "fairly soon" in the minutes of the previous meeting during June 19-20. (2) Our Fundamental Stock Market Indicator (FSMI) is bearish. It has been highly correlated with the S&P 500 since 2000, but it hasn’t confirmed the rally that started on June 1. The FSMI was back near lows for the year during the week of August 11. The good news is that initial unemployment claims, one of the FSMI’s three components, fell to 363,750 during that week on a four-week average basis. That’s the second-lowest reading this year. Jobless claims are inversely correlated with the S&P 500. (3) Investors Intelligence Bull/Bear Ratio is relatively neutral. This sentiment indicator rose to 1.9 this week, just about at the midpoint between the often bullish and bearish extremes of 1.0 and 3.0, respectively. Market sentiment, as measured by Investors Intelligence Bull/Bear Ratio, is relatively neutral. The percentage of bulls, however, is relatively high at 47.3% (the most since April) with only 24.7% bearish. The recent jump in the bullish percentage is attributable to a big decline in the percentage in the correction camp. (4) The S&P 500 Put/Call Ratio is very bullish. The four-week average of this ratio plunged from a recent high of 2.02 during the week of June 1 to 1.37 during the week of August 17. That’s up a notch from 1.36 the prior week, the lowest reading since April 3, 2009, which was a very good time to be bullish. (5) VIX and volume are confusing. All these mixed indicators may not be as useful as in the past given that the volume of the NYSE continues to plunge and that the VIX of both the S&P 500 and the NASDAQ 100 are the lowest since 2005 and 2006. There seems to be lots of complacency among fewer and fewer players in the market. On balance, I think that stock prices may move sideways between now and the November elections. It’s certainly hard to characterize the rally since June 1 as a “Romney Rally” given that the presidential race remains in a dead heat. A few pundits have suggested that it’s actually been an “Obama Rally,” figuring that the market favors the devil we all know rather than the one we don’t. By the way, there is already some chatter that at the Democratic Convention during the week of September 3, the President will announce that Hillary Clinton will be running as his vice president. Let’s see how the market reacts to that announcement. I’m still targeting the S&P 500 at 1450 by the end of the year and 1550-1650 by mid-2013, but the situation is fluid. 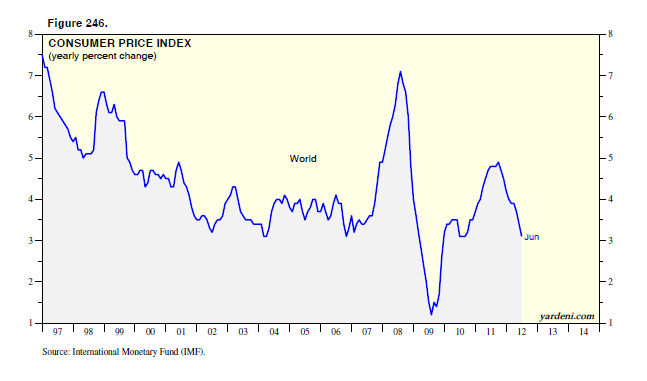 The world CPI inflation rate fell to 3.1% y/y in June from a recent cyclical peak of 4.9% during September 2011. Inflation was only 1.7% during June among advanced economies. With some volatility, it has been impressively subdued, at around 2% for over a decade. While inflation is very low in the advanced economies, it is relatively high in the emerging economies, running 2-4 percentage points higher in recent years. Consumers in emerging economies tend to spend much more of their incomes on basic staples like food and fuel. Central bank liquidity has tended to boost these prices much more than the prices of goods and services that dominate the budgets of consumers in advanced economies. The CPI inflation rate among the 30 advanced members of the OECD was only 2.0% in June. In the G7, it was even lower at 1.6%. Excluding food and energy, the former was 1.8% and the latter was 1.6%. In July, the CPI in the US was up just 1.4% y/y. Excluding food and energy, it was up 2.1%. The core inflation rate was even lower at 1.8% during June, according to the personal consumption expenditures deflator. That’s remarkable given the rebound in the CPI rent of shelter component (which accounts for 31.2% of the headline CPI and 41.1% of the core CPI) from -0.7% y/y two years ago to 2.1% during July of this year. Why is inflation so low, especially in the advanced economies? Labor costs tend to drive inflation rates in these economies. These costs have been held down by cheap labor in emerging economies and weak global economic growth. In the US, the average hourly earnings measure of wages was up only 1.7% during July. “Even as Foxconn, Apple’s iPhone manufacturer, continues to build new plants and hire thousands of additional workers to make smartphones, it plans to install more than a million robots within a few years to supplement its work force in China. The entire article is must reading. Technological innovation has always increased standards of living. It has led to higher real incomes and more jobs for skilled workers. Now technological innovations are displacing even skilled workers. That’s obviously great for profits. The net impact on employment is an open question. There’s no question that the new robot technologies are likely to bring production back to the US from China. Earnings tend to rebound sharply during the start of bull markets and to grow less rapidly as the bull ages. Based on the performance of forward earnings over the past year, this bull market is aging. After all, it will be 3½ years old next month. (1) Revenue growth is slowing. S&P 500 revenues are highly correlated with manufacturing and trade sales in the US. During June, these sales grew just 3.0% y/y, the slowest pace since November 2009. S&P 500 revenues edged up 0.3% q/q during Q2 and were only 1.9% above last year, the slowest pace since Q3-2009. Industry analysts are lowering their expectations for revenue growth this year and next year. In mid-August, they expected S&P 500 revenues to increase 2.7% this year and 4.1% next year. (2) Earnings are expected to grow faster than revenues. In mid-August, industry analysts expected S&P 500 earnings to rise 5.7% this year to $103.39 and 11.7% next year to $115.46. (3) Profit margins are expected to increase. The only way earnings can grow faster than revenues is if the profit margin rises. Sure enough, industry analysts expect it will do just that for the S&P 500, rising from 9.3% in 2011 to 9.5% in 2012 and 10.1% in 2013. I'm not as sure that margins will increase this year and next year. Another characteristic of an aging bull market is a peak in the profit margin. When margins peak, earnings growth tends to slow down to about the pace of revenue growth, which also tends to slow down in an aging bull market. (1) Personal income and retail sales are rising. I am encouraged to see that the Earned Income Proxy--which I calculate by multiplying aggregate hours worked in the private sector by the average hourly wage--rose 0.7% during June to a new record high. It rose again by 0.2% during July, to another new high. It is highly correlated with private wages and salaries in personal income. It is also highly correlated with retail sales, which rose 0.8% in July, the first gain in three months. Excluding gasoline service station sales, retail sales also rose 0.8% during July to a record high. (2) Consumer confidence is mixed. Despite the improvement in retail sales during July, consumer confidence measures were mixed in August. The present situation component of the Consumer Sentiment Index (CSI) rose from 81.5 in June to 82.7 in July and 87.6 in August, the best reading since January 2008. The CSI’s expectations index fell from 67.8 June to 64.5 in August. The weekly Bloomberg Consumer Confidence Index, which is highly correlated with the Consumer Confidence Index, rebounded nicely earlier this year, but has been weakening in an erratic fashion during the spring and summer through mid-August. (3) Jobless claims are falling again. Initial unemployment claims were hard to read earlier this year because unusually warm weather distorted the normal seasonal pattern. During the summer, auto plant closings for retooling can also distort the numbers. Those issues are less relevant now, and jobless claims seem to be resuming their downward trend as the four-week average declined to 363,750 during the week of August 11, the second lowest reading of the year so far. (4) Industrial production still on uptrend. Manufacturing output stalled during Q2. But during July it rose to a new cyclical high, and the best pace since July 2008. Auto assemblies jumped 4.4% to a new cyclical high of 11.0 million units (saar), the highest rate since June 2007. Could it be that Paul Krugman is right? Instead of arguing about the best way to narrow the federal deficit, we should be widening it! Could it be that John Williams is right? The President of the San Francisco FRB, and a voting member of the FOMC, favors QE3 and thinks that it should be open-ended! I think they are both dead wrong, but it’s hard to argue against their simple and seemingly compelling solutions to our economic woes. They both seem to agree that the only reason that fiscal and monetary policies haven’t worked so far to revive self-sustaining economic growth and to bring down the high unemployment rate is because everything that’s been done to date hasn’t been enough. If a trillion dollars in government spending and a trillion dollars in quantitative easing didn’t work, then we should have done twice as much. It’s not too late to do that now, in their opinion. I was quoted in Kathleen’s article: “Some economists say the Fed should hold QE3 in reserve, in case lawmakers cannot agree to forestall tax increases and spending cuts scheduled to take effect in January and the economy falls off the fiscal cliff. QE3 'is the only ammunition we have,' said Wall Street economist Ed Yardeni. 'Now is not the time to waste QE3 just because the economy is not growing fast enough or creating enough jobs.' Williams' response: 'We want to position the economy to be strong in advance of that,' he said. 'If you are really worried about running out of ammunition, you want to act more aggressively, more quickly and better prepare yourself for that eventuality.'" Of course, the reason that interest rates are near zero is because the FOMC has repeatedly promised to keep the federal funds rate near zero through 2014. To make sure that the Bond Vigilantes don’t push yields higher, the Fed has purchased large quantities of Treasury bonds and mortgage-backed securities through QE1, QE2, and Operation Twist. QE3 might be next, and it might be unlimited. In effect, the bond market no longer exists. It’s been nationalized by the Fed! The Fed’s reckless monetary policies have certainly enabled Washington to pursue reckless fiscal policies. Krugman’s response is that interest rates are near zero because of a “deleveraging shock” that is depressing household and business spending. The right policy medicine is the standard Keynesian prescription of more government spending, in his opinion. Compelling stuff. I’m almost ready to go over to the Dark Side. However, there are some serious flaws in the case for open-ended fiscal spending funded by open-ended quantitative easing. It violates one of the basic rules of economics: There is no free lunch. (1) Entitlements now account for 60% of government outlays, up from less than 45% in 1987. (2) About a third of total federal outlays are deficit-financed. (3) Public debt outstanding rose to a record $15.9 trillion during July. That’s over $100,000 per person in the labor force. The American Recovery and Reinvestment Act of February 2009 cost $800 billion, yet the number of teachers dropped 313,800 and public construction fell 14.7% since it was enacted. Where did the money go? Hard to say, but some of it probably paid for the pensions of retired teachers and cops rather than for keeping more of them on the job. The decline in public construction suggests that there really were no "shovel-ready" projects in America. Why, pray tell, would spending (squandering) another $800 billion produce a better result? Money is always free if you can steal it without getting caught. That’s what we are doing to our children. Krugman and Williams are endorsing the Theft of Generations. Perhaps Mitt Romney was right after all: The next President of the United States should be Paul Ryan. The Congressman is 42 years old. He represents the next generation that will be burdened by all the debt (free money) that we are accumulating to pay for the entitlements of the current generation. No wonder that Ryan’s “Path to Prosperity” plan to wipe out the federal debt by 2063 focuses on reforming Medicare and Medicaid. The former would be privatized starting in 2023, which would exempt anyone age 55 and over. Under the plan, seniors get government vouchers worth about $8,000 to go toward the cost of a private insurer of their choice. By 2034, the eligibility age would increase from 65 to 67. The coming presidential election is likely to be momentous. Americans may give another four-year term to the current Democratic administration, whose guide book seems to be Saul Alinsky’s Rules for Radicals. Alternatively, the Republican challengers seem to be guided by Friedrich Hayek’s The Road to Serfdom and are promising to take us down a different road, i.e., the path to prosperity. In any case, if we continue to borrow as though government debt is free money, our children will be serfs for sure. Japan is the poster child for where geriatric societies with generous social welfare programs are headed. There’s plenty of free money in Japan with the 10-year government bond yield under 1%. The government has been borrowing lots of it. The national government debt is at a record 200% of nominal GDP. “The burden of escalating payments for the elderly is falling on an increasingly pinched younger generation of Japanese. While spending on elderly benefits--and the cost of serving debts to fund them--rises steadily, government expenditures on education and science have fallen. “That is creating irritation among many in their 20s and 30s who have had to make do with low-paying temporary jobs, as companies have responded to two decades of stagnation by reducing the number of young people they hire and cutting pay and benefits. “One network-news show recently described people in their 60s and 70s as ‘the generation that got away’ before Japan's next wave of problems. Those in their 40s and 50s were ‘the generation desperate to get away.’ Those in their 20s and 30s: ‘The generation that can't get away.’"
By the way, "Money for Nothing" is a single by British rock band Dire Straits, taken from their 1985 album “Brothers in Arms.” It was one of their most successful singles, peaking at number one for three weeks in the US. I wonder if Krugman knows the lyrics, which suggest that if you want to make money without working, learn to play the guitar and play it on MTV. On several occasions since March 2009, I’ve had the opportunity to compare the bull market that started back then to Rodney Dangerfield, the comedian who passed away in 2004. He always started out his monologues saying: “I don't get no respect!” The latest disrespect of the bull market came from Bond King Bill Gross, who compared it to a Ponzi scheme in his latest Investment Outlook. A week ago, I observed that Bill’s pessimistic outlook for corporate earnings is based on his “new normal” prediction that GDP growth in the US is likely to be subpar for many years to come. Even if that’s correct, corporate earnings are increasingly driven by global business opportunities, which have been expanding dramatically since the end of the Cold War. So it was encouraging to see that US real merchandise exports rose to a new record high of $1,323 billion (saar) during June. The trade deficit also narrowed significantly during the month, suggesting that Q2’s real GDP gain of 1.5% (saar) might be revised upwards closer to 2.0%. That’s all rather impressive given that the JP Morgan trade-weighted dollar is up 5.1% y/y. Also encouraging is that an index measuring the volume of world exports rose 1.9% to a record high during May. However, June export data available for other countries suggest this index weakened that month. In current dollars, exports of the G6 industrial nations (i.e., G7 less the US) fell 3.7% during June. UK and German exports fell 10.5% and 3.6% during the month. In Asia, exports fell during July in China, South Korea, and Taiwan. Mario Draghi is very clever. He is also a bit hard to understand. English is not his native language. Indeed, it’s possible that something was lost in translation when he delivered his most recent comments in English at an investment conference in London on July 26 and at his press conference following the latest meeting of the ECB’s Governing Council on August 2 in Frankfurt. Both were extremely important, in my opinion. Both sparked lots of controversy about what was actually said and intended. The remarks in London were off the cuff and suggested that Mr. Draghi was shooting from the hip. On the other hand, he started the press conference with a short prepared statement, and then responded to lots of questions from reporters with extemporaneous, but well-thought-out answers. Indeed, most of Draghi’s policy punch lines were delivered during the Q&A portion of the press conference. Policymakers almost always announce their policy changes by reading from carefully prepared texts. Mr. Draghi seems to prefer an unscripted delivery of his message, which can be a bit disorienting for those of us conditioned to the more typical approach. (1) What is the ECB’s mandate? Let’s first start with the most important statement he made in London: “Within our mandate, the ECB is ready to do whatever it takes to preserve the euro. And believe me, it will be enough.” His other comments in London and Frankfurt strongly suggested that, in his view, the ECB’s mandate is in fact to do whatever it takes to preserve the euro! Our friends at The Bank Credit Analyst recently observed that the ECB's actual mandate is spelled out in Article 105(1) of the Maastricht Treaty. It starts out stating that the ECB’s primary objective “shall be to maintain price stability.” It then states that the ECB will also support the euro zone’s “common market and an economic and monetary union.” The BCA team notes that a “breakup of the euro would cause wild swings in prices…hardly price stability in action.” Good point. (3) What needs to be done? In his prepared text, Mr. Draghi put the onus on governments to make the risk premia disappear by proceeding with fiscal consolidation and structural reforms. He acknowledged that this takes some time. In the interim, governments must allow the EFSF/ESM rescue funds to intervene in the bond market if circumstances warrant such intervention, but only if such help is provided to governments that are abiding by the funds’ strict guidelines. If governments fulfill these requirements, then the ECB “may undertake outright open market operations of a size adequate to reach its objective.” The Governing Council might also implement “non-standard monetary policy measures,” which were not specified. This “conditionality” requirement is the main reason why the skeptics are skeptical that anything meaningful has changed in the ECB’s approach to easing the European financial crisis. In effect, Draghi is saying that if governments seeking aid from the rescue funds tighten their fiscal policies, the ECB will ease monetary conditions for them. In his August Investment Outlook posted on PIMCO’s website on July 31, Bill Gross declared that the "cult of equity is dying.” That’s a late call since the cult has been mostly dying after flourishing during the 1990s, as evidenced by the secular downtrend in valuation multiples since 2000. The bull markets of 2003-2007 and since 2009 have been widely disparaged by perma-bears, including Mr. Gross, as cyclical rallies (“sugar highs”) in a secular bear market. In any event, high-profile predictions such as this one by Mr. Gross have often been great contrary indicators. So far so good. However, it will be some time before we know for sure whether Mr. Gross will be proven right or wrong. The question for now is whether the logic of his argument makes sense. I don’t think so. He bases his pessimistic outlook for stocks on his view that “GDP growth itself is slowing significantly due to deleveraging in a New Normal economy.” He may be right about that, but US corporations are finding more of their growth overseas. What matters is the outlook for overall world GDP and for business opportunities on a global basis. Mr. Gross believes that because “conditions…have never been more favorable for corporate profits,” they can only get worse. The growth trend line for both after-tax corporate profits in the National Income and Product Accounts and nominal GDP in the US has been about 7% since 1960. In recent years, profits have been growing above this line, while nominal GDP has fallen below it. In my opinion, this is a sustainable divergence, assuming that overseas profit opportunities continue to outpace domestic ones. The growth trend in S&P 500 forward earnings remains around 7%. Oddly, in his concluding paragraph, Mr. Gross contradicts his central thesis: “Unfair though it may be, an investor should continue to expect an attempted inflationary solution in almost all developed economies over the next few years and even decades. Financial repression, QEs of all sorts and sizes, and even negative nominal interest rates now experienced in Switzerland and five other Euroland countries may dominate the timescape. The cult of equity may be dying, but the cult of inflation may only have just begun.” In an inflationary scenario, I would think that stocks might significantly outperform bonds. To be fair to Mr. Gross, I think his sensationalist writing style detracts from his basic message, which is that equity returns may be subpar for a while and almost certainly less than the actuarial assumptions of most pension plans. That’s a reasonable assessment, though it could be wrong too if corporations continue to find plenty of global opportunities to boost their profits, as I expect. Friday’s payroll employment report wasn’t weak enough to justify another round of quantitative easing by the Fed. Nor was it strong enough to take QE3 off the table. So the FOMC made the right decision last Wednesday, i.e., to talk about doing WIT (Whatever It Takes), rather than doing it. What will they decide to do at the September 12-13 meeting of the FOMC? Probably more of them same, i.e., keep talking about doing something. Over the past 12 months, payroll employment gains have averaged 153,170 per month. That pace is likely to continue over the next 12 months. There are few reasons to expect otherwise, with the exception of the dreaded fiscal cliff. In this scenario, the Fed might feel compelled to implement QE3 as the only policy response available since fiscal policy would be gridlocked. This, then, is a good reason for the members of the FOMC to hold off on QE--even if employment remains lackluster over the rest of this year--until they see how Congress deals with the fiscal cliff between now and yearend! While July’s payroll gain was better than expected, the overall report confirmed that the labor market remains challenging. The one bright spot is that the YRI Earned Income Proxy rose 0.2% during July to another record high, following a gain of 0.7% during June. It is simply aggregate weekly hours times average hourly earnings in total private industries. It is highly correlated with private industry wages and salaries in personal income. That could be a good omen for retail sales and overall consumer spending in coming months. Other employment indicators confirmed the slow pace of improvement in the labor market. Most heartening is that initial unemployment claims rose just 8,000 to 365,000 during the last week of July after falling 31,000 the previous week. However, the weekly data have been especially volatile in recent weeks. On the other hand, the Monster Employment Index of online job ads fell 6 points during July to 147. However, it remains on a slow, but not so steady upward trend. One very good reason for the Fed to hold off on QE3 is that QE2 seemed to have the unintended consequence of boosting food and fuel prices, which depressed consumers’ purchasing power and spending. The terrible drought in the US is pushing grain prices up to record highs, while gasoline prices are rebounding as tensions mount between Israel and Iran. In other words, real incomes are about to get hit again. There is nothing the Fed can do about it other than to make it worse. The drought in the US is quickly turning into a major disaster. I may have to lower my forecast for GDP for the second half of the year if it doesn’t abate soon. Yesterday, the US Agriculture Department added 218 counties in a dozen states as disaster areas. That brings this year's total to 1,584 in 32 states, more than 90% of them because of the drought. More than half of US counties now are classified by the federal government as natural disaster areas mostly because of the drought. The 7/31 WSJ reported that farm incomes won’t be battered by the drought “as widespread use of crop insurance and record corn and soybean prices cushion the blow to growers.” That may be so, but the drought is likely to depress spending on farm equipment, including light trucks. The economies of the Midwest and the South have been particularly strong thanks to their booming agriculture and manufacturing industries. Now even manufacturing is showing signs of slowing, as evidenced by the latest survey of purchasing managers. There was some very good news in June’s personal income report. Total wages and salaries rose 0.6% to another record high during the month. I am not surprised since it tracks the YRI Earned Income Proxy very closely, as I noted following the release of June’s employment report at the beginning of the month. This augurs well for consumer spending in coming months, though such spending was unchanged during June. It was also encouraging to see that the Consumer Confidence Index rose during July to 65.9 from 62.7 in June. However, it was odd that the present situation component of this index ticked down given the strength of wages and salaries. Perhaps June’s headline news was unsettling and may have offset the improvement in paychecks. I still expect to see better retail sales figures over the next few months.